Inspired by torches lining romantic fortress walls, this dazzling polished nickel sconce illuminates and beautifies your castle. 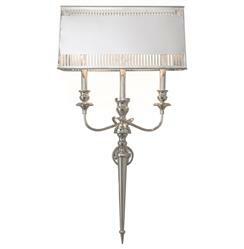 Elegantly shaped, solid brass rises into three delicate limbs before disappearing behind the shimmering shade. Parallel cuts in the nickel allow light to pass through and cast intriguing shadows on all of your adventures.